This graphic has been circulating on Facebook for a couple of days. I saw it for the first time last night and was struck at how things have changed in the national mindset. 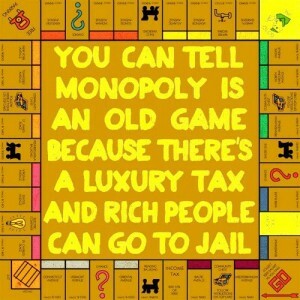 The game, which can trace it origins back to 1904. certainly has a different portrayal of the world that we see things in 2012. What has remained constant are mortgages, rent, and bankruptcy. Hope you all enjoy this little bit of New Year Humor!